With Banana, one can import from whatever format (see the list of current supported formats). In case you should need to import from other file types that are not included in the list, specific Banana Import Apps can be developed. In order to transfer data just one single time, please consult Transferring data from other accounting software. According to the type of destination table, different import formats are availbale. 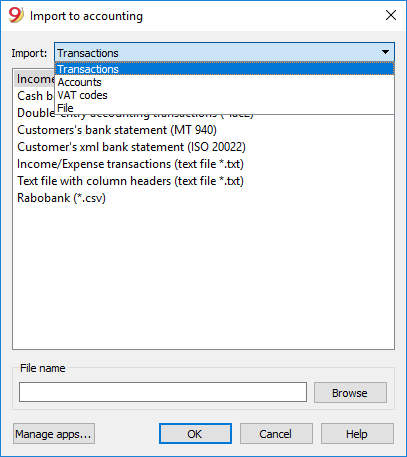 These are files that are especially created with other programs (for example, a program that creates invoices) so that the data can be transferred into Banana Accounting. Technical indications on how to prepare these type of files can be found here. There are also other file types for which a specific import filter exists or has been created. The name of the file of which the data need to be imported needs to be indicated here. To add or to update import filters. Scripts that decode file types can be created. In case error messages appear during an import operation, update, first of all, the Import App.